Although I am inclined to call this post CSI: Freezer, it’s been suggested that I think of more provocative titles to elicit more page views beyond my usual seven, so anyone logging onto this site in search of a debonair bon vivant hung like Mr. Ed so whip-smart, he effortlessly quotes Marx, “Outside of a dog, a book is a man’s best friend. Inside of a dog, it’s too dark to read,” will be sorely disappointed. As a consolation prize, I can offer a tale featuring my anything-but-a-wimp sidekick, Greg, and although he did not agree to appear naked in Lame Adventures, I am partly at fault for this since it never occurred to me to ask. This tale does come equipped with an element of danger. Only Greg, Under Ling, and I were still at work as we were closing in on five o’clock in our place of employ, Always a Dull Moment, when Greg enters wielding two one pound bags of Peet’s Coffee beans, French Roast and Major Dickason. Since he and Under Ling are the java drinkers, he asks her which one she prefers they drink first. Under Ling votes French Roast. 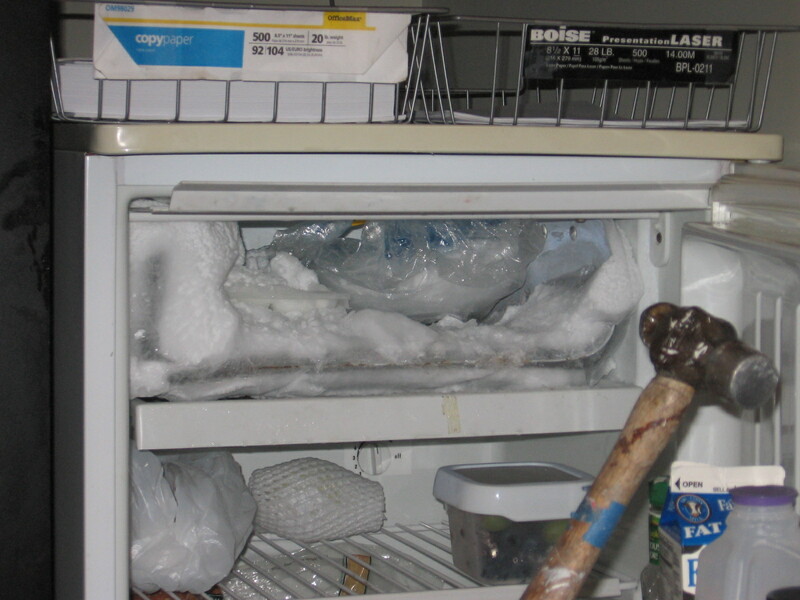 Greg decides that he will freeze the second bag of beans in our refrigerator’s freezer compartment that was last used so long ago, that slab of frozen tabloid tundra, Levi Johnston, had yet to begin being fruitful and multiplying. Greg: There’s something in here. Me (staring at a floor tile document while yawning audibly): The Tofutti Cuties we didn’t finish in 2006? Greg: No, it’s something in a plastic baggy. I instantly regain complete consciousness and nearly suffer whiplash as I turn towards Greg showering him with my full attention. Me (hopeful): Could it be herbal essence someone forgot about? Under Ling: What’s ‘herbal essence’? What are you guys talking about? Greg knows exactly what I’m talking about. He gets a glint in his eye, leaves and returns with a ball-peen hammer. He proceeds to smash the block of frozen frost to smithereens with such vigor the hammer head starts to loosen. Under Ling stands near watching him, fascinated. I am hearing Peter, Paul and Mary sing If I Had a Hammer on my internal iPod. Since Greg and I share the same wavelength, or possibly because my loud off-key humming is so infectious, he’s compelled to hammer out a warning, not so much all over this la-a-and; just confined to our o-o-office. Greg: Under Ling, you might want to stand back. This hammer’s getting loose. I don’t want it to fly off into you. Under Ling moves the equivalent of a football field away from Greg. Greg (muttering while continuing to pound): But if it goes anywhere first, it’s gonna be right into my forehead. Me (donning my supervisory hat): Try to avoid doing that. Can you tell what it is yet? Greg (through gritted teeth): Almost there! Me: You have your rolling papers on you? Greg: Yeah. [He does one final he-man smash.] Okay, here we go! 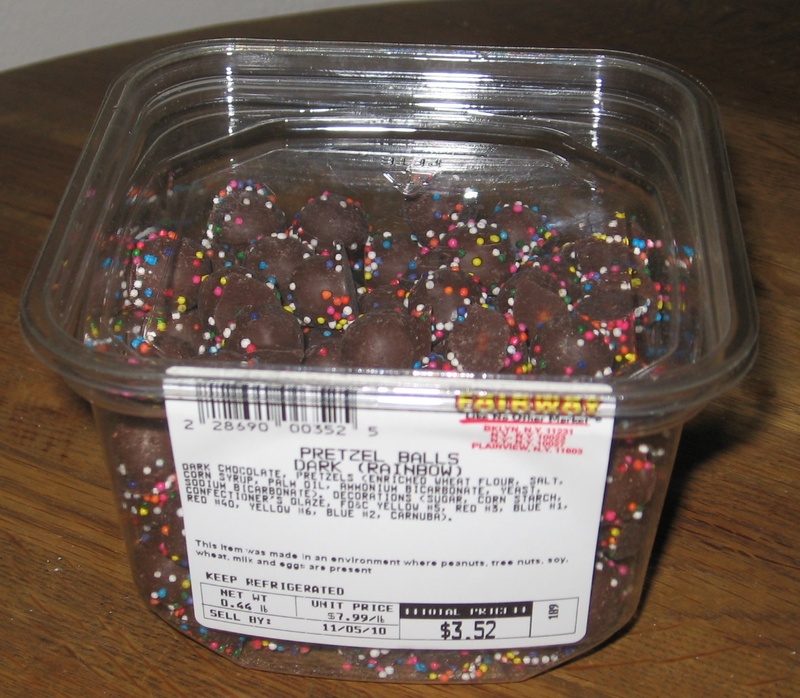 I have visions of scarfing an entire container of dark pretzel balls to stave off the munchies I’m anticipating. Greg: It’s a bag of ice! Under Ling: Why do we have a bag of ice in there? Me: A ‘bag of ice’? That’s it? 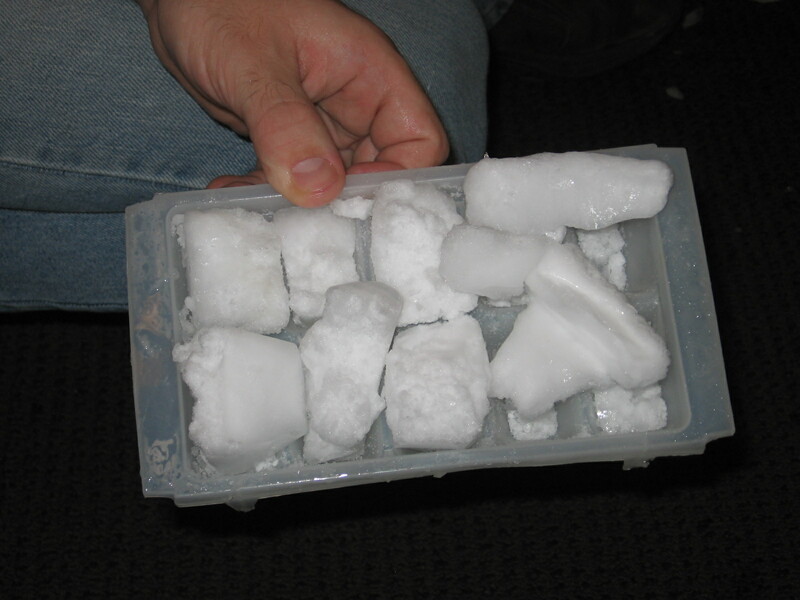 Greg reaches in and pulls out a frost covered tray of ice cubes. 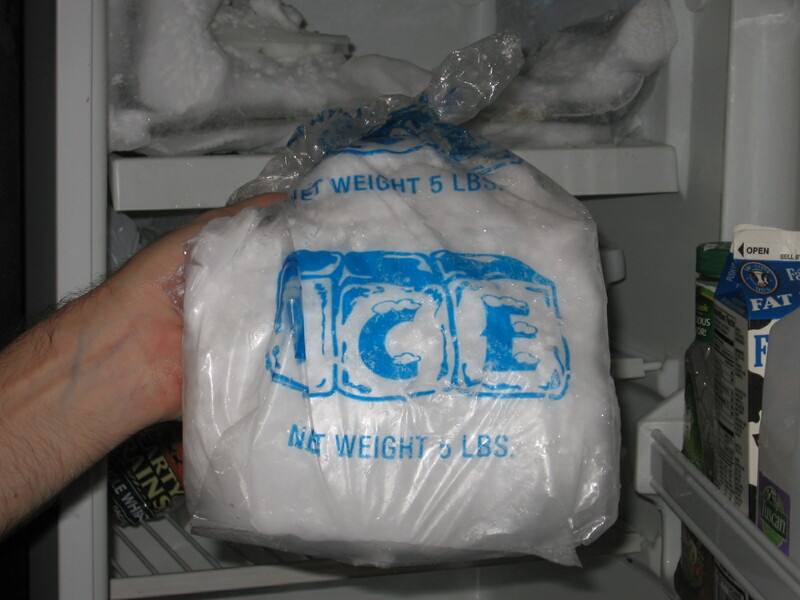 Greg: Someone froze a bag of ice in the freezer all these years! Me: Throw it out. If anyone claims it, they waited too long. As Greg cleans the mess from his manual defrosting he sniffs. Greg: I think I smell a dead mouse. Come over here. Check it out. Since my D-cup proboscis has the olfactory properties of a search and rescue dog, I rise from my chair and conduct second opinion sniffing. I deeply inhale the entire area including an errant coffee bean Greg inadvertently spilled two months earlier. Me: No. That smell is from all that vintage frost you smashed. I return to my desk. Under Ling follows. Under Ling: Are you sure there’s not a dead mouse in our freezer? Me (definitive): I’m sure we didn’t freeze a mouse corpse. Satisfied, Under Ling returns to her desk and goes back to work. Greg and I exchange sidelong glances, still sharing disappointment in the finding. Notes about WordPress adding some doodads to this site, there is now a “star” button for you to click if you like what you read. Since WordPress is eternally optimistic, sorry to say that for those of you that would prefer a garbage pail button you’re out of luck. WordPress has also added a Tweet button if you’d like to share the Lame in the Twittersphere. This entry was posted in Humor and tagged freezer, frost, groucho marx, levi johnston, marijuana, mr. ed, peet's coffee. Bookmark the permalink.